Building relationships with your students is often more important than any reading or math skill that we'll teach in our classrooms. When kids know you care, they'll work harder and enjoy school more. One way to strengthen relationships with your students is by recognizing their birthdays. Let them know you care by focusing on their special day! The good news? It doesn't have to cost a dime! 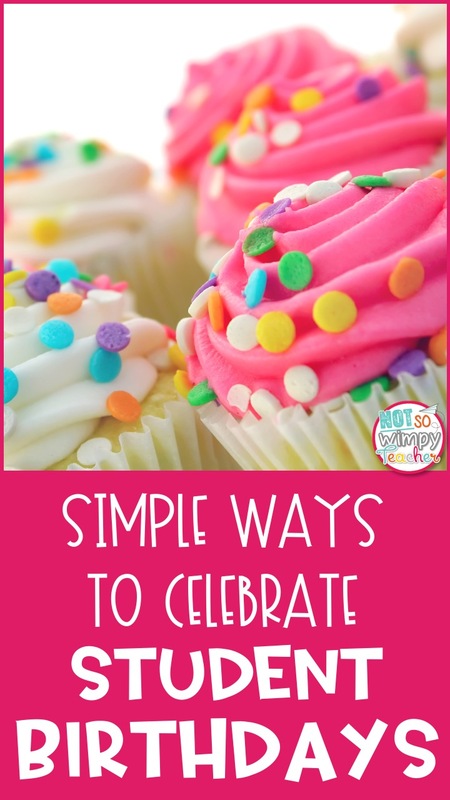 Try these simple ways to celebrate student birthdays. Grow your classroom library and celebrate student birthdays by inviting them to bring in an extra copy of their favorite book. Students can write their name and birthday in the front of the book and add their special story to your shelves. Have the student read their book (or a portion depending on the length) aloud to the class. For struggling readers, you may choose to read to them. Your students' birthdays will be part of your classroom forever while letting them provide their own gift of literacy! Grab this free birthday letter by clicking HERE. No matter how old kids get, they love hearing happy birthday sung to them. The whole class will love joining in the chorus, and it builds a sense of community. Make sure to join in with the tune and show your kids it's OK to sing and be silly! Consider teaching your students "Happy Birthday" in a different language to promote cultural diversity. I actually made mine into a cheer! Teacher: I don't know what I've been told! But _____ just turned ____ years old! This is one of my favorite activities to do on a child's birthday. Write the child's name on a chalk or whiteboard in colored dry erase markers or chalk. While the child sits in front of the board, have each student come up and say something nice about the birthday kid. They will then write their compliment on the board. When finished, you can take a picture of the child surrounded by positive comments to send home with the student and share with their parent(s) or guardians. I love using brag tags all year to motivate and reward my students for meeting academic and behavior goals. You can read more about how I use brag tags HERE. On a student's birthday, it's fun to give them a special tag! This tag is in my brag tag bundle. Star students are not just for PreK and kindergarten. Elementary students love being recognized for simply being a unique individual. What better day to do that than on their birthday? Invite the birthday girl or boy to bring in something special to them for show and tell or to share a special talent or skill with the class. Leave your students feeling special and recognized on their birthdays. Remember that some students will not have birthdays on school days. Celebrating half birthdays or other designated days can be just as meaningful with these simple ways to celebrate student birthdays.